The sharp rise of house prices in China’s Tier-1 cities has fostered a great deal of commentary about the possibility of bubbles forming there. However, China’s unique housing market characteristics make it difficult to assess the macroeconomic severity of bursting bubbles, even if they exist. These characteristics include the setting of land supply and prices by the government, among many others. This paper looks at proposals to shore up the mortgage underwriting and legal infrastructure to help China withstand the impact of falling prices, should this occur. The recent sharp increases in property prices in some areas of China have caused fears about a real estate bubble forming there to resurface. While it is generally difficult to identify a bubble before it bursts (See Note 1), it is prudent to ask whether the financial and legal systems as they currently stand should be strengthened in order to ameliorate the impact of a bursting bubble should one occur. 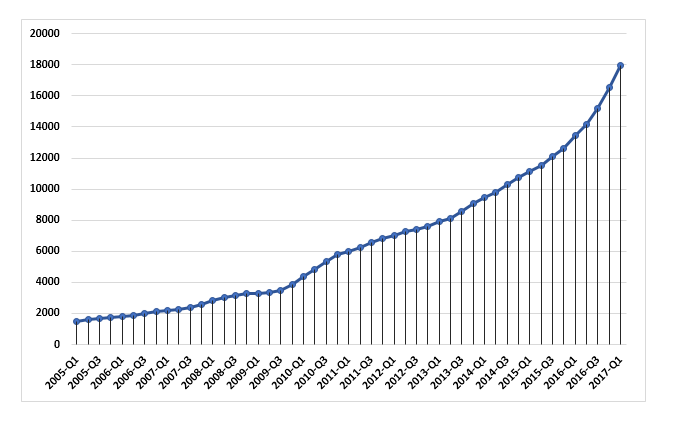 In general, a bursting property bubble is dangerous because 1) leverage in the financial system (through banks or securitization) results in systemic economic damage, and 2) rigidities in the legal process lead to persistent nonperformance of properties in foreclosure. This brief note examines these questions and suggests policy changes that can limit the fallout from property market volatility. These are based in part on evidence obtained in the wake of the bursting global housing bubble of a decade ago, notably in the United States. While international comparisons are informative, the analysis needs to keep in mind China’s unique situation (e.g. booming Tier-1 and Tier-2 cities versus “ghost cities”). China’s policymakers at many levels have been actively working to improve the functioning of housing markets across a wide variety of geographies and economic circumstances. The experience gained there is also very important in the formation of our suggestions. We focus our attention on actions that can be taken in a timely manner to shore up confidence in the housing and mortgage markets. As such, these actions are more along the lines of regulations and legal code adjustments than macroeconomic policies such as interest rates. The housing markets in China have a long history of booms and busts, largely at the local level. Policy activism has been a key characteristic over the past 30 years, both at the national level, where a wide range of policies addressing housing and finance issues have been implemented every few years, and at the local level, where buildable land supplies have been tightened and numerous local rules regulating home purchases and mortgage finance have been imposed by municipalities. Interestingly, Figure 1 shows a rather regular relationship between credit expansion and house price growth at the national level. However, this smooth pattern obscures a wide range of experiences at the local level (Figure 2). In particular, until recently, house price growth in the Tier-1 cities has far outpaced that of the rest of the country, with the markets in some smaller cities in considerable distress. These distinctions are the result of fundamental global trends as well as local considerations. Urbanization is a fact of life around the world. Large so-called “Gateway Cities” are attracting global capital flows which has pushed up prices beyond every traditional measure of affordability. On the local level, distinct characteristics regarding local land policies have resulted in some cases in oversupply. The result is that it is very difficult for “one size” macro policies, such as interest rates, to be effectively applied given the different issues across geographies. There are two broad areas of systematic concern in the current situation. First, households are becoming increasingly indebted, raising the risk of distress in the banking system should prices fall (see Figure 3). The volume of residential mortgages in the Big Four cities increased by 22 percent in 2016 and now stands at nearly 25 percent of GDP. 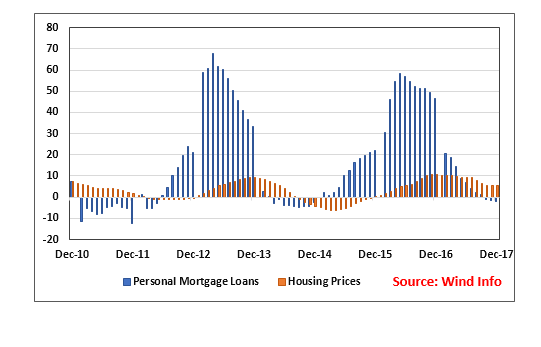 China’s ratio of residential mortgage debt outstanding to GDP is at the lower end compared to the housing finance sector in developed economies (e.g. those in the European Union, the United States, and Hong Kong SAR). 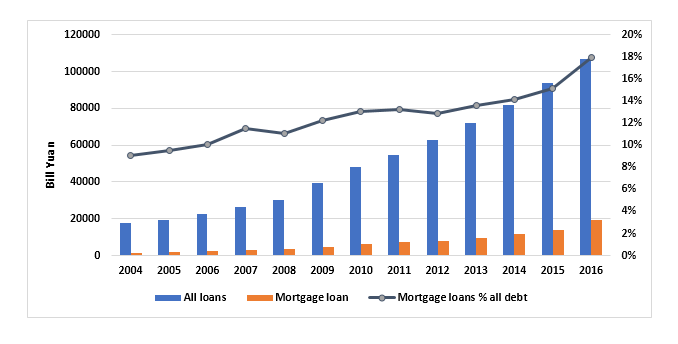 Nevertheless, mortgage debt accumulation raises the concern of risk concentration and sustainability due to the rapid accumulation of household indebtedness within a short period of time and the insufficient diversification of risks in household investment portfolios in addition to the housing finance system in general. The second systematic concern is the oversupply of buildings in “ghost cities,” where high vacancy rates can lead to financial distress in the banking sector. Both of these problems would be exacerbated should growth slow, providing a strong incentive for authorities to be vigilant about the ongoing expansion of the economy. The mechanisms governing delinquency and foreclosure in China are both unique and rather complex. Mortgages in China are recourse, so banks have a variety of options when a borrower falls behind on payments. In particular, many mortgages are guaranteed by a thirdparty (such as a family member or a guaranty company) so banks often choose to go to the guarantor rather than to the borrower for compensation. However, in the case of widespread delinquencies associated with a general trend of falling house prices, the interconnected nature of the obligations renders such an approach impractical. The resulting surge in judicial foreclosures then risks clogging the court system, exacerbating the impact of the downturn. An additional factor leading to heightened uncertainty is the role of shadow banks, which are lightly regulated institutions including “internet lenders” and crowdfunding. Recently, authorities have taken steps to require financial institutions to disclose their off-balance sheet activities, but much remains to be done to enhance transparency in this sector. • Improving underwriting procedures: It is important to develop rigorous metrics of payment histories that can be applied equally across borrowers. In addition, credit bureaus should be established that contain accurate information regarding household indebtedness, including that from shadow banks. Finally, strict standards for property appraisals and automated processes to monitor the appraisal firms need to be established. Besides these short-term considerations, there are a number of longer-term issues that need to be addressed in order to ensure that the housing market is safely and soundly serving its role as an efficient and fair allocation mechanism. • Providing support for underserved markets such as low income and rural housing. A government program designed to require banks to lend to underserved markets, such as ghost cities, or to small cities or low-income neighborhoods would be appropriate as long as the expected return is still positive. This is the idea behind the Housing Goals (see Note 2) and Duty to Serve Rules (See Note 3) in the United States. China’s housing market at present is at a crossroads. Authorities have stabilized housing prices in Tier-1 cities through the imposition of draconian restrictions that have drastically brought down transaction volumes. While this perhaps has stopped markets there from inflating further, prices have risen in certain smaller cities, which is a strong indication that the bubble mentality has not been eliminated. Given all the severe restrictions on supply and demand in the housing market, prices no longer serve their traditional role as a mechanism for transmitting information about the preferences of market participants. Such an outcome can barely be called a market. The authorities need to diligently institute necessary reforms so that this key sector of the economy can support China’s growth in the years ahead. Disclaimer: This research was conducted while one of the authors (Koss) was a Visiting Scholar at the International Monetary Fund. The views expressed here are those of the authors and do not necessarily represent the views of the IMF, its Executive Board, or IMF management.